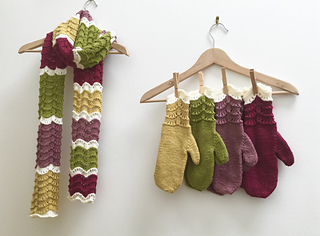 Knitted mittens with a generous scallop stitch cuff and contrast colour in DK weight yarn. Knitted flat on straight needles. 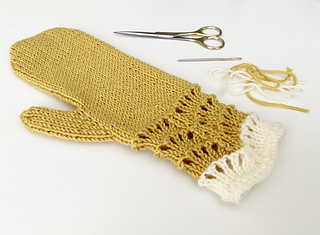 Cast on, cast off, knit, purl, slip one stitch, pass a stitch over another stitch, bring working yarn forward, make one stitch, knit 2 stitches together, basic seam sewing. 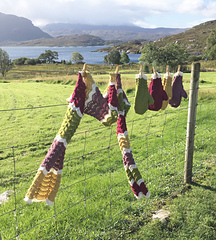 Stylecraft Bellissima DK weight yarn approximately 130m in main colour (A) and 15m in a contrast colour (B). 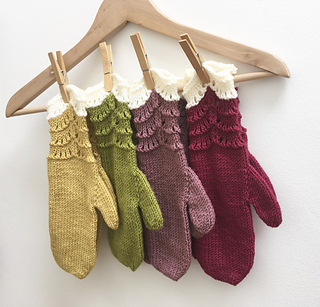 Cover image shows four pairs of mittens from left to right in main colours, yellow mellow #3925, sugar snap #3926, ash rose #3923, rio rose #3932. All with contrast on the cuff, single cream #3921. Two colours of DK weight yarn, main colour 130m, contrast colour 15m. 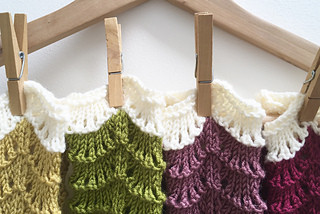 Matching “Scallop Scarf” pattern available.